A seamount, or underwater mountain, is essentially an island that rises precipitously from the deep sea floor, instead of the land progressively getting higher. Because of what this means for growth of sea life in general, seamounts tend to attract droves of fish of different kinds. Most of them do it for the wider offerings in food that the proximity to land allows, as opposed to the open ocean. But some sea creatures are attracted to seamounts for an entirely different reason. While you would think thousands of hammerhead sharks storming the coasts of this tiny island would spell instant doom for all the smaller, more helpless fish in the vicinity, these imposing creatures actually do not come to these seamounts for food. What they're really interested in are the services other fish can provide for them. 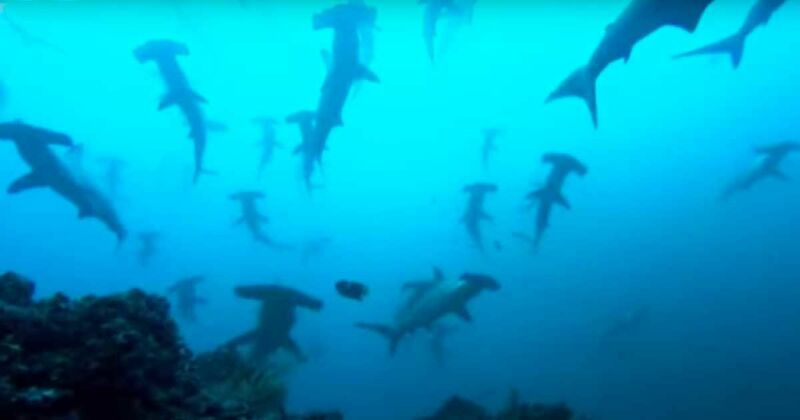 The video below shows how local fish immediately crowd to the incoming hammerheads to clean them of parasites. Sport Diver suggests the smaller fish do this in exchange for a meal, though with the amount of predators that can be seen in the video below, it's entirely possible the service is also paid for in the form of protection from more aggressive species. National Geographic theorizes another reason why hammerheads – and several other marine species – tend to swarm to these seamounts. When the tiny islands are so far away from any other shore, the hammerheads may be using them as a "base of operations" of sorts, spending the day there and then heading out to feed at nighttime. Did you know this about hammerhead sharks? SHARE the interesting video below with your friends on Facebook!